Carol K, Gardeners' World magazine. 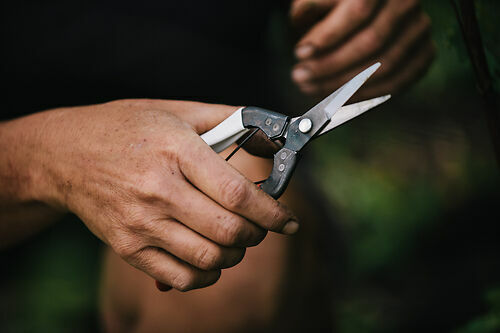 We all need a good pair of snips, ones that can live in pockets without doing any harm, and wander round the garden with us for those unplanned moments. Handy to have a couple of pairs really.... These ones from Okatsune are absolutely brilliant for flowers, fruit and veg, but aren't nearly as tough as secateurs, obviously, and are for green growth only, not woody pruning. Pointy ends are great for getting right in for careful snipping, red and white handles show up when you (almost inevitably) leave them lying around somewhere. Niwaki Tip: Overstep the mark, and they've had it.